Fanning out his concerns from frontier-America deerslaying (The Last of the Mohicans) to corporate-America whistleblowing (The Insider), in the 1990s writer-director Michael Mann did nothing much but become America’s best director. The culture didn’t always know what to make of him, a samurai modernist more passionate than ironic, and some worried unduly whether Heat was about a heist played out against relationships with women, or about relationships played out against the heist; clearly the point was that—in their sense of profound dislocation—neither cop (Al Pacino) nor criminal (Robert De Niro) knows for sure, either. 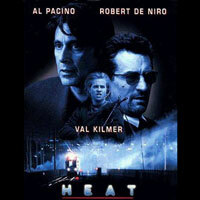 In any case Heat is the last word in crime pictures, either because or in spite of its effort to transcend the genre, to such an extent that later Mann films (Collateral) feel like variations on it, not to mention Christopher Nolan’s The Dark Knight. A three-hour noir epic as Thackeray might have written it, finally it’s hued by the masculine silvers and blues of men locked in conflicts that are finally absurd compared with those confronted by the women in their lives. With as untouchable a supporting cast as in any L.A. movie in memory (in particular Ashley Judd, Diane Venora, and Jon Voight) and a scope as emotional as it is physical, constantly weaving in and out of rooms as though they’re mesas and up and down streets as though they’re hallways, Heat prowls a city that has no respect for either interiors or exteriors, where walls are as transient as everything else.